SLIGO ROVERS HAVE parted company with manager Ian Baraclough and assistant Gary Stevens, the club confirmed this evening. The shock news follows an indifferent start to the season which sees the Bit O’Red trail league leaders Dundalk by 17 points having also crashed out of their FAI Cup defence in the second round. Sligo gave no official reason for the split with Baraclough, who ranks among the most successful managers in the club’s history. In just under two-and-a-half years at the Showgrounds he led them to the 2012 Premier Division title — Sligo’s first in 35 years — the FAI Cup, and the Setanta Sports Cup. Sligo said: “The club wish to express our gratitude to Ian for his enormous contribution at Sligo Rovers since joining in February 2012. 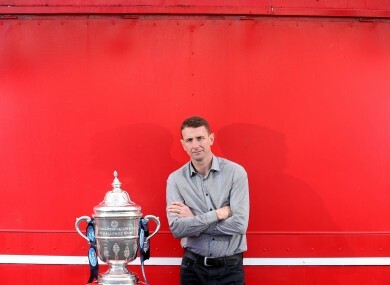 “In winning a first league title in 35 years, securing a fifth FAI Cup and a first ever All-Ireland crown, Ian’s partnership with the club has been a memorable period for the Bit o’ Red, one that will forever be part of a glorious era in our history. “We also thank Gary Stevens for the imprint he leaves on the club in both coaching of the team and his work in the community behind the scenes. Email “Another one bites the dust: Ian Baraclough gone as Sligo manager”. Feedback on “Another one bites the dust: Ian Baraclough gone as Sligo manager”.